French explorer and fur trader Rene Robert Cavelier de la Salle built the Griffin, the first ship to ever navigate the Great Lakes, in 1670. It was a sailing ship hewn from fresh-cut trees along the Niagara River, at the mouth of Cayuga Creek near the place where the town of La Salle, New York, stands today. Old drawings are but guesses of what the Griffin looked like, based upon ship design of that period. It is said the vessel was small, ranging from 45 to 60 tons burden. 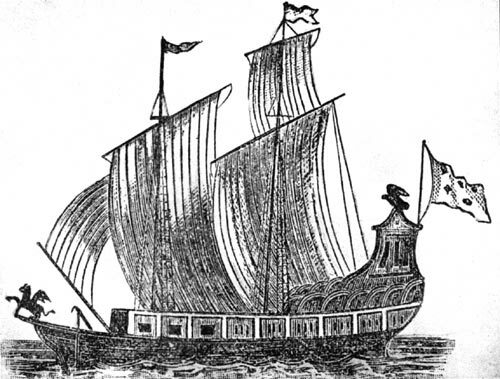 It carried seven brass cannons so technically was a ship of war even though its purpose was for the transport of furs from the lakes to New York for shipment to Europe. It took those early carpenters all the winter of 1678-79 to complete the vessel. It was launched in May. After weeks of being outfitted, the Griffin successfully set sail up the river and into Lake Erie on Aug. 7, 1679. With sails set, and flags at her mast head, bearing the sign of an eagle, and at her prow, showing the figure of the mythical griffin, the ship was a strange sight to the Seneca Indians who watched its passing from the banks of the Niagara River. They said it was a ship with wings. Carrying a crew of 32 men, the Griffin thus began its historic voyage across the uncharted waters of first Lake Erie, then up the Detroit and St. Clair Rivers into Lakes St. Clair and Huron. It was La Salle who named Lake St. Clair. The name was chosen because the Griffin crossed this small body of water on Aug. 10, the date of the Catholic festival of Saint Clair. The St. Clair River was difficult for the vessel to navigate under sail, not only because of the strong current, but also because of a gale blowing off Lake Huron. The crew literally walked the banks of the river, pulling the ship along with ropes. The Griffin entered Lake Huron on Aug. 23. It was on this lake that the vessel encountered a furious gale near what is now known as Presque Isle. The storm was so severe, wrote crew member Father Hennepin in his personal diary, the sailors fell on their knees. They prayed for delivery and sang hymns. La Salle was so frightened he made a special vow with God. He promised that if the ship was delivered from the storm he would erect a chapel in Louisiana in memory of St. Anthony de Padua, the tutelary saint of the sailor. The storm eventually eased and the Griffin arrived safely at a small settlement at St. Ignace then occupied by Huron and Ottawa Indians and a few Frenchmen. There was much celebration at the straits and the ship remained anchored there until Sept. 12, when La Salle set sail for La Grand Baie, the old name for Green Bay, Wisconsin. It was at Green Bay that the crew loaded 12,000 pounds of furs, collected in advance by French fur traders in anticipation of the ship’s arrival. This cargo, of course, was the whole point behind building the Griffin and bringing on such a long and hazardous journey through the Great Lakes. The early French fur traders knew this area, had traversed the lakes by canoe, and believed the waters were large enough and deep enough to support a full rigged ship. La Salle proved that they were right. The vessel was the first of a long line of commercial vessels to come. The Griffin set sail for Niagara on Sept. 18 and was never seen again. La Salle and Fr. Hennepin remained behind. The vessel was under the command of its pilot, a man named Luc, and five sailors, who were directed to make a call at Mickili-mackinac and then continue on East to Niagara. There has been much speculation over the years about what happened. Some theories suggested that the crew stole the furs and sank the Griffin to hide their crime. Others believed the ship was lost in yet another autumn gale. The ruins of the Griffin may have been found in Northern Lake Michigan near Fairport, Michigan by wreck diver Steve Libert in 2004. A bowsprit from a wreck dating back to the Seventh Century was found and divers claim that a solid “floor” was discovered directly under it. They believe the Griffin may be buried under the lake mud at that location. Their request to dig the site has since been locked in litigation between the State of Michigan, the U.S. and French governments.